This painting was sold at auction... thanks Jack! 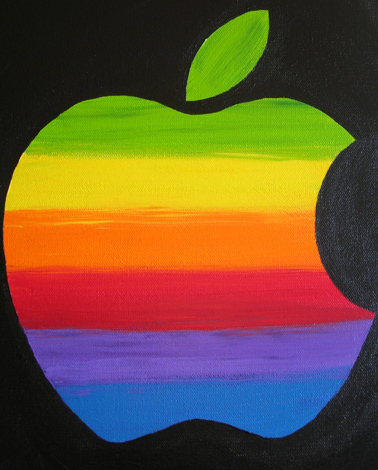 Most of us Apple fans have grown up with the original rainbow colored apple logo on our computers. It was designed by Rob Janoff and was Apple's logo from 1976 to 1998 when Jobs replaced it with a monochrome version. I miss that logo sometimes, I feel somewhat nostalgic about it. That's why I painted this commemorative painting. Perhaps it's a bit of longing for the days gone by, when Apple computers were little, beige, chunky boxes, with black and white screens, and KidPix was very entertaining. Sometimes I reminisce about those days when very few people had computers, let alone the internet in their home. You'd have to borrow a computer or go over to a friend's house to work on your resume on their Apple computer. Looking at this logo, it brings me back to the days where you could actually hear the sound of logging onto the internet with the modem happily bleeping and blopping away. It also takes me back to the days when getting an email was exciting. Untainted-by-spam email, each one was from someone you knewunimaginable today! This painting, though of a logo it may be, represents that era of when technology hadn't melded it's way into every aspect of our lives. Computers enhanced our lives, they hadn't taken over our lives at that point. Instead of precisely copying the striped colors of the logo, I painted them with expressive freedom, I want to convey the creative spontaneity and sense of fun I feel when I think of that era. I kept the logo itself crisp and true to it's apple shape to represent the business side, because Apple is a business, after all. 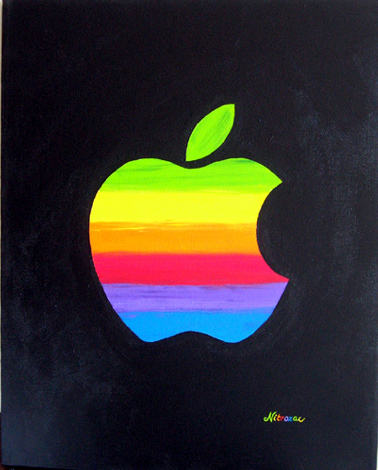 Details: "Original Apple" is Nitrozac's 37th paintng of her Painting Blog. It's an acrylic painting, on 16 x 20 inch stretched canvas, the largest canvas to date. The painting will be dry and ready to ship after the auction ends. The back of the painting will contain the title, the date painted, Nitrozac's signature, and a fingerprint for authenticity. Shipping for each painting is extra... to the US and Canada it is 25 dollars, to other locations, 35 dollars. Please Note: Canadians will be charged any appropriate taxes (GST) and PST if the bidder is from British Columbia, in addition to the sale price.